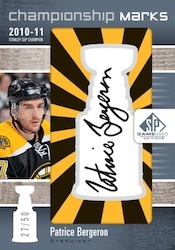 2011-12 SP Game Used Hockey is a hit-per-pack product that focuses on different combinations of memorabilia, both game-used and manufactured patches. Boxes promise one numbered memorabilia card and one numbered autograph card. Rookies fall one per pack. Collectors can also watch for random rookie hot boxes. One autographed or memorabilia card in every pack. Every box includes one memorabilia card and one autograph, each numbered to 100 or less. Each case includes at least two autographed manufactured patch cards. Boxes also have one parallel card numbered to 100 or less. Rookies inserted one per pack. Ten short printed rookies have autographed parallels numbered to 50, 10 and 1. Random rookie hot boxes included. 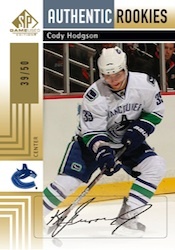 500 Goal Marks (11 cards, /25) include autographed manufactured number patches. 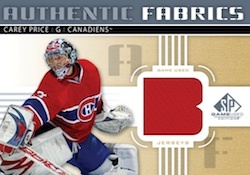 Goalie collectors will chase Supreme Pads (/10) cards that have jumbo goalie pad swatches. Authentic Fabrics Gold Letter Variation mix and match different letter and number combinations used for memorabilia card windows. Authentics Fabrics Combos include up to eight swatches. 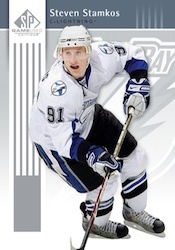 Trophy Marks have been added to the brands Letter Marks manufactured patch line. Career Legacy cards feature two, three and four memorabilia swatches. 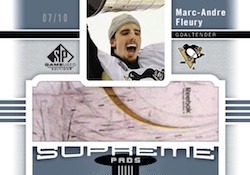 Top-Selling 2011-12 SP Game Used Hockey cards.